I wrote earlier that it was probably driving Google crazy to see people “amazed” that Bing is doing stuff that Google itself has long offered. Now Google’s fighting back. The first shot? 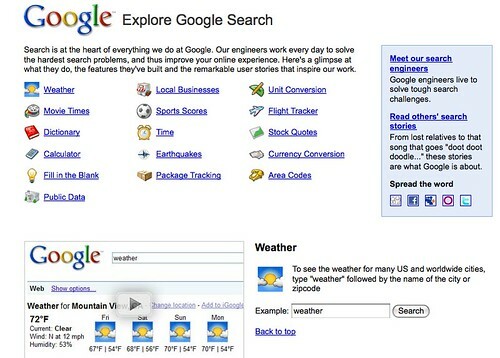 A new Explore Google Search page. Search is at the heart of everything we do at Google. Our engineers work every day to solve the hardest search problems, and thus improve your online experience. Here’s a glimpse at what they do, the features they’ve built and the remarkable user stories that inspire our work. To me, this page is all about doing that stepping up. Of course, the page is well worth reviewing, for those who aren’t aware how Google can provide everything from sports scores to flight tracking. As can Bing, and as can Yahoo.